When Joseph Pepe opened a liquor store along Concord Pike in 1958, the area was so isolated, his customers parked on the main road. At the time, Concord Pike was two, one-way roads and the city of Wilmington didn't even bother plowing it after a snowstorm, Joseph's son, Ralph, recalled. In fact, Ralph said family and friends questioned why his dad Joseph even moved the family out there from downtown Wilmington. "They asked him why he was going out there," Ralph remembered. Nearly 60 years later, Concord Pike, also known as U.S. Route 202, is one of the hottest retail locations in the Mid-Atlantic. Demand for prime retail space is so great, Ralph said he turns down monthly offers from regional developers to purchase the Talleyville Towne Shoppes, a 57,000-square-foot retail center he owns at the corner at Route 202 and Silverside Road, and convert it into space for a big box store, fast food restaurant or gas station. From the Pennsylvania border to the I-95 exit ramp in Fairfax, Concord Pike is suddenly hip. The demand for spots along the highway is so fierce, local landlords are demanding some of the highest rents in the region, according to a study by CBRE Inc., a commercial real estate brokerage firm. 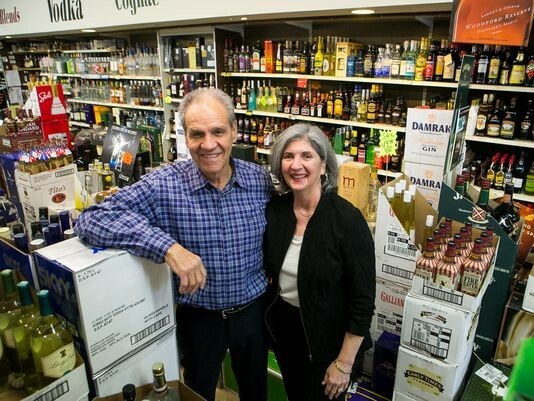 Ralph said he won't sell because he prefers the shopping center's diverse mix of small businesses, which includes his Concord Pike Liquors over a national chain retailer. "This area doesn't need another gas station or big box retailer," he said. "Over the years, a lot of businesses have opened up here and I've encouraged them. They are entrepreneurs building their businesses in Delaware and helping the economy grow." CBRE analyzed retail rents across 24 markets in Pennsylvania, New Jersey and Delaware. Large metropolitan areas including Philadelphia, Scranton, Allentown, Harrisburg and Reading were studied along with suburban retail hot spots such as Princeton/South Brunswick, Cherry Hill and Exton/Downingtown. The study revealed Concord Pike landlords charged new tenants an average of $28.60 per square foot in the year's third quarter. That was only outpaced by trendy King of Prussia's average asking rent of $41.95 per square foot and Philadelphia's Main Line suburbs, where space leased for $31.74 per square foot. Asking rents along Concord Pike bested the market average of $21.08 per square foot. In contrast, space at the Christiana Mall leased for about $20.86 per square foot, according to CBRE. Concord Pike also experienced the largest rent appreciation among study's 24 markets, topping Trexlertown, Pennsylvania, Princeton and Lancaster. "Some of these leases signed 10 years ago expired and owners have been aggressive in their asking rents," said Ian Anderson, director of research and analysis for CBRE's Philadelphia office. "Wilmington's employment numbers are very strong and landlords have been able to hold out for what they want." Concord Pike's anchor stores — large retailers used to attract traffic and smaller businesses to a shopping center — paid an average rent of $21.45 per square foot, the highest in the Tri-State region. Anchor Stores in King of Prussia paid $17.82 per square foot and no anchor stores are located along the Main Line. On average, anchor stores throughout the region paid an average rental rate of $15.19 per square foot. Store owners say they are not surprised by Concord Pike's success. Betty Bronstein, owner of Aritsan's Gifts & More in the Fairfax Shopping Center, has spent 21 years operating a business along Concord Pike. She said sales have grown every year since she moved to the area, enabling her to double the store's size and increase her product offerings. "When I was looking for a place for my business, people told me Fairfax was the gold coast," she said. "I truly believe that it is." Factors including easy access to I-95 and out-of-staters taking advantage of tax-free shopping drive retail demand. But the main reason is local retailers' ability to draw from two strong customer bases. On one side of the highway, large employers AstraZeneca and JPMorgan offer high-paying, executive-level jobs. On the other side are diverse neighborhoods with median incomes above the state and national averages. Combined, they help populate the more than 50,000 cars that travel Concord Pike each day. "Concord Pike has a good income base on both sides of the highway," said Bob Aerenson, president and CEO of Rojan Inc., a real estate company that owns a portion of Fairfax Shopping Center and a Pep Boys in the area. The average median income in the Concord Pike market is $89,661, according to CBRE. Only three other regions in the survey — Princeton/South Brunswick, Marlton, and Exton — reported higher incomes. Neighborhood Scout, an online website that tracks neighborhood demographics. Neighborhood Scout also ranked Fairfax/Deerhurst among the top 15 percent for income in America. Just down the road from Fairfax/Deerhurst, home prices drop, but only slightly. In Talleyville/Blue Rock Manor, the median real estate price is $274,409. That is still more expensive than nearly 70 percent of the neighborhoods in Delaware and 68 percent of those in the United States. Neighborhood Scout did not provide median income data for Talleyville/Blue Rock Manor but reported the neighborhood as having a higher median income than 83 percent of communities in the United States. "If you work at AstraZeneca you may have found us on your lunch hour and if you live in the neighborhood you may have found us shopping at Walgreen's next door," Bronstein said. Concord Pike's rental rates are rising faster than any other market in the tri-state area, but retailers who spoke to The News Journal said they haven't been priced out yet. Bronsten said she signed a long-term lease several years ago and doesn't have to worry about renewing it for some time. Terry Cragg, who co-owns My Mailbox Store with her husband, Jeff, described her rental rates as "pricey, but not awful." She knows retailers who are waiting for open space at the Fairfax Shopping Center, creating a seller's market. "Our rent has gone up, but compared to other mailbox stores, it hasn't been that bad," she said of her store in the Fairfax Shopping Center. Aerenson said brokers call him frequently to see if he has vacant space. He said his rates have not really increased because space in the shopping center rarely changes hands. "Our demand fluctuations aren't good or bad because we don't have a lot of turnover," he said. "Real estate comes down to location, location, location and Concord Pike is a great location with a great community, great population and high-income level. That's why we've had very little turnover." Some retailers worry Concord Pike's economic boom could end soon, however. Art Pleasanton, owner of Fairfax Hardware, said he is concerned about AstraZeneca's shrinking workforce. The drug giant had about 5,000 workers at its Fairfax campus nearly a decade ago. Today, the company employs about 2,000 there. AstraZeneca is marketing the 30-acre campus for sale. It is not clear if the company will relocate. AstraZeneca has pledged to remain in Delaware and sources familiar with the offering say the company is looking for a deal where it would lease the property back from a buyer. Earlier this year, AstraZeneca moved 143 workers from its shuttered Fort Washington, Pennsylvania, plant to Fairfax. "It is a good community, but that could change easily enough," Pleasanton said. "Without good paying jobs, the communities could suffer." Aerenson said the uncertainty surrounding AstraZeneca has stoked fears among some store owners. "It's a huge concern," he said. "When employment is good, people are buying houses. They need things for those houses, so they go out shopping." Cragg said AstraZeneca's recent job cuts had impacted sales, but added the decline was "not devastating." She is confident in Concord Pike's ability to survive potential job losses, noting that JPMorgan, which sits directly across from AstraZeneca, is adding 1,800 workers in Delaware. Some of those workers will be based in Fairfax. "It's always been good here," Cragg said. "It is a busy location with a good neighborhood behind it." Ralph Pepe agreed. "If AstraZeneca fails, they will be replaced by someone else," he said. "My customer base has stayed steady so I don't worry about it." Retailers said the neighborhoods will help Concord Pike endure any tough economic times that could be lurking. Aerenson said the locals are what sets Concord Pike apart from other shopping districts. Hundreds of new residents will be added next year. Wilmington developer Buccini/Pollin Group is redeveloping Concord Plaza near Silverside Road and Concord Pike into 300 luxury apartments atop restaurants, cafes, stores and a new office building. "The Christiana Mall is more of a regional shopping district, but Concord Pike is local," he said. "People come into Walgreen's four or times a week. How many times a week do you go into Nordstrom or Neiman Marcus? " The mix of stores catering to local residents has created stability among Concord Pike retailers. Aerenson said store closures in the region have been the result of large national chains deciding to eliminate stores, rather than a mom and pop store struggling out of the gate. For example, the RadioShack at the Concord Mall was one of 1,700 locations the electronics retailers shuttered across the country. "Most of our turnover is the result of corporate decisions," he said. Store owners say their success has begotten the success of other stores on Concord Pike. Bronstein said multiple customers a day come into her store after stopping at Walgreen's or the nearby pet store. "People have come in here for many different reasons," she said. "They might need something at Walgreen's or the hardware store, but they'll stop in my store. There is a real sense of community." Tina Cianfaro, manager of Sweet Lucy's Ice Cream & Treats, said Saturday afternoons in November and December used to be the store's slowest times. Since 2014, she said, the store's late winter Saturday afternoons have been filled with holiday shoppers looking for a sugar boost. "There used to be a lull, but now we get peak hours on Saturdays in December," she said. "You'd be surprised, but afternoon rolls around and people want ice cream." Cianfaro credits Concord Pikes' retail success to its proximity to I-95, saying the store draws customers from New Jersey, Pennsylvania and even Maryland. "It connects to I-95 and that is the bloodline of the East Coast," she said. "We've been snagging those customers."